The most remarkable thing about the Bundy trial up in Oregon isn’t the verdict or the insane aftermath. It’s the number of people who are just now realizing that Jury’s have the power and – if you were to read the Framers – the responsibility – to nullify government laws and actions. Imagine, if you will, a Country where active, engaged, and virtuous citizens sat on juries every day and had the final say on whether a law passed by the Legislature, executed by the executive and deemed Constitutional by the Judiciary, really is okay with We the People? Just think about it. Now do you begin to see the picture? The jury, by definition, is the final bulwark against government tyranny. By definition. Not just by our understanding. Not a right. A responsibility of the citizen. Then we’re stunned when a jury cannot see the truth of the issue and makes bad decisions. With the erosion of the 6th Amendment, more by our own apathy than any actual attack by weathering, you can quickly see why the others begin to lose in the courtroom. Then we come up with really stupid ideas. Let’s have “professional juries.” Right, let’s have government employees judging between the government and the accused. The next time you personally get a jury summons, think about what that really is. It is a call from the people who founded this country, framed this government and defended it against all enemies, to you to do your part as a citizen in the republic. So as far as the Bundy trial goes, it was pretty clear that jury was going to nullify. When the next one doesn’t, with the same charges and the same facts, ask yourself why? It’s quite hard for me to get really excited about the latest Hillary eMail scandal. Don’t get wrong, I understand – and have from the beginning – why this matters and what it all means. The problem is that there is a portion of this country that just does not in any way, shape or form, care. Now we have one side coming unglued by what they say is a violation of the Hatch Act. The other side that says that “this changes everything” (it doesn’t change anything). Did Hillary break security requirements? Yes. She did. Only the most rabid of Clinton supporters still denies that in the face of the evidence and the pronouncements of the FBI director back in the summer. To them, it just doesn’t matter whatsoever. They. Do. Not. Care. So what happens now? Why all this hubbub now? Is the FBI Director actually trying to interfere with the election? Does anybody actually believe that? I had a great weekend in Tehachapi. Just a time to spend with family. 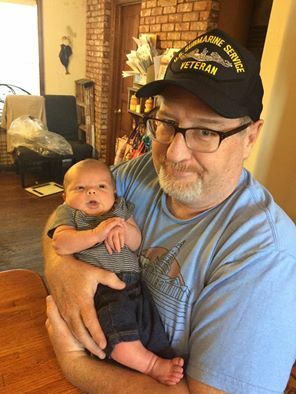 I met my… um… grand nephew, I guess? My Nephews’ son, Jackson Elliot Bowman, for the first time. Got to take Ben swimming and train watching. Had a celebration of my baby sisters 43rd birthday, and a great time sitting around the table at breakfast talking with my Mom and Dad about the politics of the 1960s. Family, my friends, family. Posted on October 31, 2016, in 2016 Presidential, 6th Amendment, Ben, Constitution, Family, FBI, Hillary Clinton, News & Notes, Supreme Court and tagged 6th Amendment, Ammon Bundy, Constitution, Constitution Thursday, eMail Scandal, FBI, Hillary Clinton, Jury, Oregon. Bookmark the permalink. 2 Comments. Thank you for this i served on a jury recently in downtown Sac . Was for a 30 year old cold case. Posted Sac bee article about it on my line. Great stuff today thanks!